Jeff Anderson’s testimony begins at 40:00. For many years, Americans have expressed a clear desire for real health-care reform. They want reform that would lower costs, increase choice, and improve the quality of care. Unfortunately, the Patient Protection and Affordable Care Act, commonly known as Obamacare, has taken us in the wrong direction in each of these areas. Even more than that, Obamacare consolidates and centralizes power at the expense of Americans’ liberty. It severely restricts a free people’s ability to contract freely with one another. It mandates that, for the first time in more than 200 years of United States history, private American citizens must buy a product or service of the federal government’s choosing or else pay a penalty — what the law calls an “individual responsibility penalty” — for failure to comply with this command. A nation “conceived in Liberty” is living under a health-care law that is predicated on coercion. What’s more, the Congressional Budget Office (CBO) now projects that Obamacare will cost American taxpayers $1.7 trillion over ten years for its insurance-coverage provisions alone — roughly double the $871 billion tab that was cited at the time of its passage through this body on Christmas Eve 2009. At the same time, however, Americans are not particularly eager to return to the pre-Obamacare status quo. They have been waiting patiently — for six years now — for Obamacare opponents to unite around a free-market alternative that deals with costs, deals with coverage, and deals with the individual market without disrupting the employer-based market. The 2017 Project’s “Winning Alternative to Obamacare” would accomplish these goals, and the Supreme Court case of King v. Burwell provides a welcome opportunity to advance such an alternative, offer real reform, and give the American people what they want. If the Court rules that, in states with federal exchanges, the Obama administration has been paying out subsidies in defiance of the law, Congress will have a prime opportunity to pass legislation that would do the following: Give the 37 affected states — as well as the 13 others — an off-ramp from Obamacare that would lower health costs, secure liberty, and ensure that anyone who wants to buy health insurance is able to do so. The result would be the effective repeal and replacement of Obamacare in up to 37 states — or even more, if some of the 13 states with their own exchanges chose to take the off-ramp as well. This off-ramp should lead to a replacement that would fix what the federal government had already broken in our health-care system even before Obamacare was passed. For roughly 70 years, the government has provided a generous tax break for millions of Americans with employer-based health insurance, while millions of Americans who buy insurance on their own have been denied such a tax break. This is unfair, and it has undermined the individual market. The “Winning Alternative to Obamacare” advanced by the 2017 Project — the organization I run — would address this unfairness in the tax code without touching the tax treatment of the typical American’s employer-based insurance. Those with employer-based insurance would continue to get their full tax break on insurance that costs up to $20,000 for a family or $8,000 for an individual, and anyone with a more expensive plan would still get the full tax break on that first $20,000 or $8,000. An alternative advanced in the context of King v. Burwell would not have to address the employer-based market in any event, as that would be beyond the scope of the ruling. Such an alternative need only provide an overdue tax break for those in the individual market, in the form of a simple, non-income-tested, refundable tax credit. Unlike Obamacare’s subsidies, which almost always go directly to insurance companies, these would be actual tax credits, going directly to individuals or families. For most Americans, they would come in the form of a tax cut. Because the tax credits would not be income-based, they would be far simpler, reduce the IRS’s role, avoid disincentivizing work, avoid imposing a marriage penalty, and let every person or family quickly compute what they’d be getting. Perhaps most importantly, they would finally address the longstanding inequality in the tax code for all Americans. The 2017 Project’s alternative would offer tax credits of $1,200 for those under the age of 35, $2,100 for those between 35 and 49, and $3,000 for those 50 and over — plus $900 per child. A family of four with 40-year-old parents would therefore get a tax credit of $6,000 to use for buying health insurance of their choice. If they shopped for value and found a policy for less, they could deposit the difference in a health savings account (HSA). The 2017 Project’s alternative would also offer a one-time, $1,000-per-person tax credit for having or opening an HSA, which would give a family of four another $4,000 in seed money to help cover out-of-pocket costs. According to a Government Accountability Office report released on the eve of Obamacare’s implementation, tax credits in these amounts would be sufficient for healthy Americans to be able to buy insurance even if they paid no more than $15 a month of their own money toward the plans — except in five states, and people in those states could buy across state lines. If Congress were to respond to a ruling against the Obama administration in King v. Burwell by offering such non-income-tested tax credits, it would benefit millions — perhaps tens of millions — of middle-class Americans who get nothing from Obamacare but the tab. That’s because, for all of its expense and coercion, Obamacare did not solve the longstanding inequality in the tax code. Not only does Obamacare give subsidies to insurance companies, rather than tax cuts to Americans, but a wide swath of America has no access to the subsidies. According to the Kaiser Family Foundation calculator, the typical single woman who is 40 years old — or younger — and makes $35,000 a year — or more — doesn’t get a dime in Obamacare subsidies. She’s too young and too middle class. Under the 2017 Project’s alternative, every 40-year-old single woman would get a $2,100 tax credit, to help her buy health insurance of her choice. Even though it would benefit far more people than Obamacare, such an alternative would actually cost much less — which is a testament to how expensive Obamacare is and how lavish its subsidies are for the chosen few. 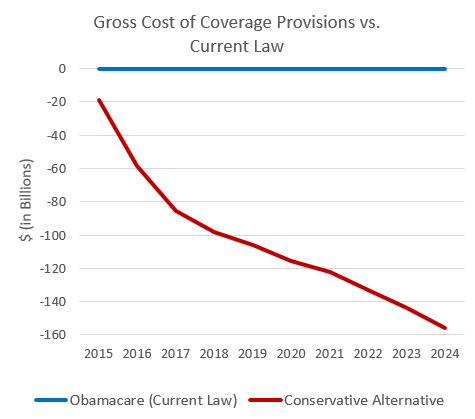 According to the nonpartisan Center for Health and Economy, which is co-chaired by Princeton health policy expert Uwe Reinhardt and former CBO director Douglas Holtz-Eakin, the 2017 Project’s “Winning Alternative to Obamacare” would save $1.1 trillion in federal spending over a decade versus Obamacare, while increasing the number of people with private health insurance by 6 million versus Obamacare. It would also substantially lower premiums and dramatically expand access to doctors. It would provide the sort of real reform Americans want. The 2017 Project’s alternative would also provide commonsense consumer protections, as well as funding for state-run “high risk” pools, to ensure that no one could be denied affordable health insurance on the basis of a preexisting condition. For example, no one could be dropped from his or her existing insurance, or be re-priced, due to a health condition. When young men or women turn 18, or leave school and go off of their parents’ insurance, they would have a one-year buy-in-period during which they could not be denied coverage, or charged more, for a preexisting condition. Parents would have a similar one-year buy-in-period for newborns. People could move from employer-based plans to individual plans, or move from one individual plan to a similar or cheaper individual plan, without being denied coverage or being re-priced because of a preexisting condition. And $7.5 billion a year in federal funding for state-run high-risk pools would ensure that anyone could buy partially subsidized insurance, through these pools, that covers preexisting conditions. If Congress were to give states an off-ramp that leads to simple, flat, age-based tax credits for everyone in the individual market, protections for those with preexisting conditions, and the elimination of all of Obamacare’s liberty-sapping mandates, it would be a very popular proposal. The millions of mostly lower-income Americans who had been getting Obamacare subsidies in defiance of the law’s plain language — and who would be getting nothing in the wake of a ruling against the administration — would get a generous tax credit to help them buy affordable insurance of their choice. Moreover, because they were already covered, if they were to switch to a more affordable plan, they could not be charged more — or denied coverage — because of a preexisting condition. Meanwhile, the millions — perhaps tens of millions — of middle-class Americans who have never gotten anything under Obamacare would get a long-overdue tax break to buy insurance of their choice. Such tax breaks would be worth thousands of dollars to millions of Americans. They would finally fix what the federal government has broken through the tax code and allow the individual market to flourish. States deserve an off-ramp from Obamacare that leads to a winning alternative. For six years, Americans have opposed Obamacare and have waited to be offered something better. Now is the time to give it to them. (The 2017 Project’s full proposal, entitled “A Winning Alternative to Obamacare,” follows. The vast majority of Americans shopping in the individual market would supplement this tax credit with their own expenditures, freely choosing to buy insurance that costs more than the tax credit would cover. For them, the tax credit would be a source of savings, freeing them from the burden of paying for all of their insurance costs with after-tax dollars, while those with employer-based insurance have theirs paid for with pre-tax dollars. For example, for a family of four with parents in their early 30s, the tax credit would cover the first $4,200 in premiums ($1200 × 2 + $900 × 2), and they could, of course, supplement that with whatever amount they choose. Meanwhile, those who buy insurance that costs less than the amount of the tax credit would be allowed to keep the difference and put it into a health savings account (HSA).